Malta U-19 will play in the European Championship finals after booking their place via the qualifiers. The Aquatic Sports Association have announced that Enemed are the new sponsors for Malta’s senior national team, the juniors and the women’s teams. 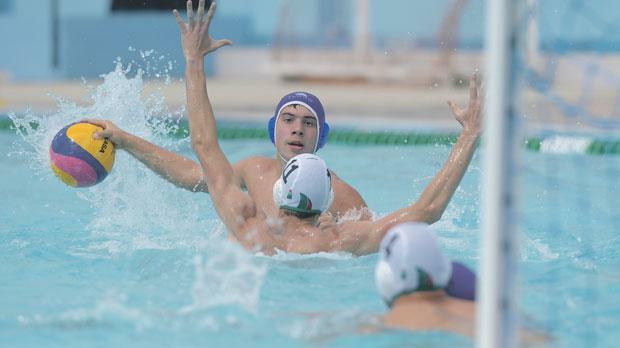 The association’s president Joe Caruana Curran told a news conference yesterday that this was welcome news for Maltese waterpolo which in recent years has been in the forefront in upholding the prestige of the game through various encouraging results. He said that it was very satisfying for the association to obtain material assistance from the sponsors in the form of outfits when our representative teams are playing for their country. Besides the jerseys and other attire bearing the logo of Enemed the sponsorship includes other tangible assistance. During the course of the press conference the sponsorship contract was signed and exchanged between Caruana Curran and Kevin Chircop, executive chairman of Enemed . The ASA top official said that he appreciated the presence of top government officials when the senior team participated in the Euro 2016 in Belgrade. Referring to the sponsorship Chircop, said that the ASA and Enemed are in synch since both entities are in the process of developing further in their different spheres. Also present was Konrad Mizzi, Minister Without Portfolio. Mizzi said he was impressed by the commitment of the national team in the Belgrade Euro finals when Malta generally performed to acceptable standards. He continued that soon after coming to Malta he made arrangements for Enemed officials to contact the ASA with a view to sponsoring the national teams. This was fuelled by the fact that he was proud by Malta’s performances. During the event the juniors national coach, Anthony Farrugia and his assistant at this level, Karl Izzo, spoke of the tight schedule which awaits our junior squad of 13 players after they travel to Alphen, Holland, to take part in 16-team European Championship finals which start this weekend. After winning three of their four qualifiers last May, beating Ukraine, Slovenia and Bulgaria for second place, the players are raring to go. They have been drawn in Group D where they are due to meet Hungary on Sunday morning, Montenegro on Monday and Greece on Tuesday, followed by the matches for placings, a tough schedule compressed over a week. The coaches said that the objective is to improve on previous placings and with players, most of whom militating regularly in our top division, the target at best is 13th place which should see our team competing against Azerbaijan, Turkey and home team Holland.